Established in 1998, HERITAGE CATTLE COMPANY is committed to providing ‘Real World’ Brahmans and service, while building personal relationships with our clients. My wife, Gayla, and I have enjoyed countless memories and experiences working together as a family with our three daughters, Megan, Kristen and Erin. As a fifth generation grandson of Josiah Dawson Hudgins, better known as J.D. Hudgins, I have had the privilege of growing up in the Brahman cattle business. My chosen career has afforded me the opportunity to travel to many countries, judging livestock shows, consulting for breeding programs, and just visiting old friends. In the United States we have been fortunate to have exhibited several National and International Red and Gray Champions. We also work closely with the commercial producers in the U.S., providing them with the right kind of bulls and heifers needed to be profitable. Our junior show heifer market is also on the rise, and children ages 8 to 18 are turning to Heritage Cattle Company for their show projects. Each summer we host a special show we call the Heritage Classic. This show is designed for juniors with Heritage branded or Heritage bred heifers. Also, during the summer we host the Heritage Cow Camp. This camp is designed to expose and educate our children to different segments of the beef cattle industry. Each year we address a different topic of interest. As we embark upon a new era in the ranching business, we salute our forefathers for leaving us a legacy of cattle history. Moreover, we honor them for instilling within our family the importance of honesty and Christian values that has lasted for over seven generations. 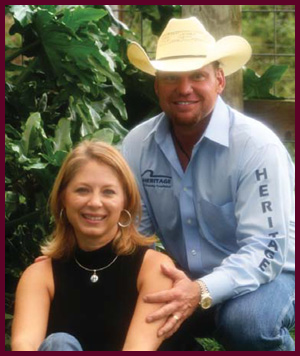 Heritage Cattle is owned by Judd Cullers and his family. He combines his experience and expertise toward the success of his cattle business. He serves as an ABBA official judge and spends a large amount of time working with cattlemen in the United States and around the world.